Heading to KL for a weekend getaway? Make reservations for your accommodation via Booking.com. Select from 3-star hotels like the Prescott Hotel Kuala Lumpur Sentral, Simms Grand Inn and more. Keep your eyes peeled for Booking.com vouchers to enjoy further discounts. Terms and conditions apply. Visit Amsterdam with its word-class museums, lovely restaurants and gorgeous canals. Book your stay with Booking.com and get a discount for your bookings. Be sure to keep a lookout for Booking.com discount code! Terms and conditions apply. Stay in a mountain lodge in Switzerland and be surrounded by dramatic landscapes and beautiful mountains! Don't miss Booking.com promo codes to score awesome discounts for your bookings. Terms and conditions apply. Booking.com deal: RM600/Night at the Anantara Riverside Bangkok Resort. Get 50% discount on travel destinations worldwide using Booking.com! Get the best prices, deals and promotions on 1,138,696 properties worldwide on Booking.com in Malaysia, Singapore, London, Tokyo & more destinations. Get an offer or promo code or two when you subscribe to the Newsletter.... Valid until further notice Booking.com T&Cs apply. Booking.com Serves Up a Platter of Turkish Desserts! For anyone on the lookout for the best travel deal for added savings, the combination of Booking.com and ShopBack is unbeatable. Find the best Booking.com coupons, promo codes and deals on ShopBack and earn additional cashback every time you make a booking from this site. Here we bring you some of the best offers at present. Insider deals Up to 6.0% cashback Get over 50% off on destinations worldwide | Booking.com promo offer is applicable on 1,138,696 properties worldwide in Malaysia, Singapore, London, Tokyo & more destinations. For similar services, be sure to also check out Agoda and Hotels.com on ShopBack for deals, discounts and cashback. A traveller’s delight, Booking.com is an online portal that makes travel easy and affordable for everyone. This company invests in digital technology that helps take the friction out of travel. They connect travellers with the world’s largest selection of incredible places to stay, including everything from apartments, vacation homes, and family-run B&Bs to 5-star luxury resorts, tree houses and even igloos. 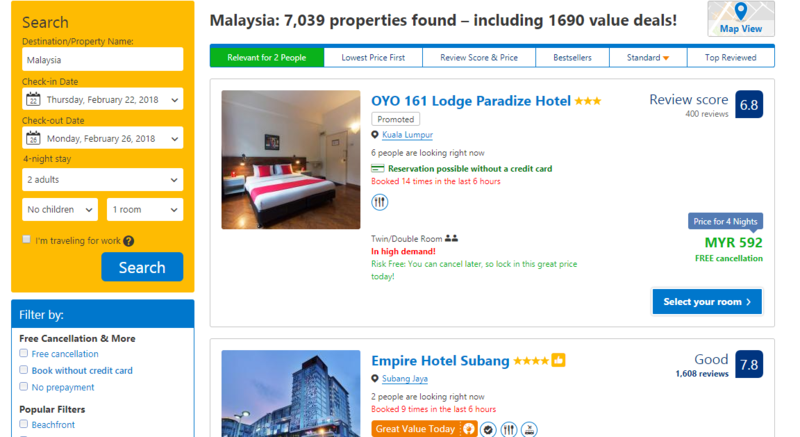 In addition, the availability of deals, discounts and other Booking.com offers allow traveller’s in Malaysia to explore the world without breaking the bank. In its effort towards global integration and best travel access for everyone, the Booking.com website and mobile app are available in over 40 languages, offer 1,663,721 properties, and cover 127,866 destinations in 228 countries and territories worldwide. The company began its journey with one man in a small office space in Amsterdam. Geert-Jan Bruinsma, a tech savy individual with an entrepreneurial spirit wanted to bring together Dutch travellers and their desired accomodation. This was the reason for the creation of online booking service, Bookings.nl. Geert's little start-up grew steadily in its first few years, jumping from its first employee in 1999 to 50 people by 2002. By 2005, Bookings.nl had local support offices in the UK, France, Spain, Portugal and Germany, setting the company well on its way to becoming the market leader for European bookers. This growth and its potential, driven by the locally relevant and demand-driven strategy, did not go unnoticed by other large players in the travel-sphere. The Priceline Group acquired Bookings.nl and combined it with another European company, Active Hotels, in 2006 resulting in the Booking.com we know today. The company has grown leaps and bounds since its humble beginnings and is now the biggest player in the Priceline Group’s portfolio, booking roughly 1.5 million room nights every 24 hours in over 125,000 destinations around the world. This online website allows customers to book multiple services to make their trip an experience to remember. Whether you are travelling on a budget or looking to indulge a little, Booking.com has everything you require. The booking services offered here are outlined below. Booking.com offers individuals several accommodation options without any booking fees to suit their travel. From selecting a budget hotel to popular suites, this site has it all. To book your accommodation, simply follow the steps given below. Step 1: Click the ‘Accommodations’ tab on the home page and enter your details such as city, travels dates and number of travellers. Here, business travellers can select the business travel option which offers them instant access to places with features like free Wi-Fi, breakfast and parking options. Step 2: You will be redirected to a page showing you all the available properties at best prices and Booking.com secret deals for your holiday. You can even list them by price, review score, bestsellers etc. by choosing for the header section. In addition, the filter menu on the left allows you to customise your search for properties based on location, budget, facilities and a lot more. Step3: Click on the room you like and review the information given. In case you would like to reserve the room, click on the reserve button. In case of a deal or promo code, you may be able to see multiple options showing discount prices and deals such as free cancellation. Choose the rate you like best and click on ‘I’ll reserve’. Step 4: Enter all your details to confirm the booking. In case you are travelling with kids or have any special requests, you can add the information here. Once confirmed, click on final details for payments and other information. Once your booking is complete, you will get a confirmation e-mail from Booking.com for the same. Step 1: Click on the ‘Flights’ tab on the main page and enter all relevant details to see the flights available. Step 2: You will be redirected to a page listing all available flights at the best deals. Look for the Booking.com discount codes on popular flights for amazing savings. Step 3: Click on the flight or deal that you like best. Review the details, enter your information and payment information and book your flight. Step 4: You will receive a confirmation e-mail for your booking. Make the most of your vacation by renting a car, an additional service brought to you by Booking.com. As a result, traveller no longer need to rely on public transport or be dependent on cabs every time they want to explore. Simply select a car for hire from this site and take charge of your vacation, your way. To book a car, click on the ‘Car Rentals’ tab on the main page and enter your details in the page that opens. You will be able to see all available car options along with important information and details. Choose the car that suits your travel or family the best and have it waiting for you when you reach your destination. · Your voucher / eVoucher, to show that you’ve paid for the car. · The main driver’s credit / debit card, with enough available funds for the car’s deposit. · Each driver’s full, valid driving licence, which they’ve held for at least 12 months (often 24). · Your passport and any other ID the car hire company needs to see. Different car hire companies have different requirements, so please make sure you check the car’s terms and conditions as well. Also, for most car hire companies, the age requirement is between 21 and 70 years old. If you’re under 25 or over 70, you might have to pay an additional fee. Space: Choose a car with plenty of room for your passengers and luggage. Fuel policy: Pick a policy according to your travel plan. For someone not planning on driving much, a Full to Full fuel policy can be an immense money saver option. A vast majority of the rentals include Theft Protection, Collision Damage Waiver (CDW), local taxes, airport surcharges and any road fees. However, you’ll pay for any ‘extras’ when you pick your car up, along with any young driver, additional driver or one-way fees, among others which will be mentioned in detail at the time of booking. For more details on what’s included, be sure to check out the details displayed at the time of confirmation. A great feature of Booking.com is that it takes care of all your travel requirements from hotels, flights, cars to even airport taxis. With this service, travellers don’t have to spend half their day waiting in lines at the airport for a shuttle bus or cab, but can pre-book the same on the site with the help of Rideways, the world’s leading provider of online travel & related services. Whether one is travelling alone, with the family or for business, they’ve got you covered. Step 1: Enter your journey details and click search. Step 2: Choose the taxi you'd like, from a car to a people carrier, Standard to Luxury. Step 3: Enter the passenger details, including a mobile phone number, email address and flight number if you're booking an airport transfer. Step 4: Complete the payment to confirm your booking. You can pay with Visa, American Express and MasterCard, as well as most major debit cards and PayPal. Some hotels also accept other credit cards for the actual payment of stay; these are indicated during the booking process. Keep in mind that some properties require a prepayment. The prepayment is an amount charged by the property before your stay. The date of the payment and how much is charged depends on the property's prepayment policy. When it comes to travel, budget restrictions are one of the prime factors that can stand in the way of a memorable experience. To facilitate travel by everyone, this site offers several Booking.com coupons promo code offers, discount code vouchers and a lot more. You can find them at the top of all searches for easy access. Whether you are planning your trip in advance or looking for a last-minute getaway, the right coupon code could help make your travel experience a happier experience. In addition, don’t forget to subscribe to their newsletter to get the latest Booking.com sale offers, and coupon codes delivered straight to your inbox. Come November, the annual online Black Friday Cyber Monday sales is coming back in full force, bringing exclusive deals and cashback to ShopBackers. When it comes to the holiday season and the season of giving, we often forget to reward ourselves for the year's hard work. Thus, during the Black Friday sales, pamper yourself with a trip overseas by making use of Black Friday deals. Not many people plan for shopping in advance, which is understandable. However, during the Cyber Monday sales, there are coupon codes, vouchers and other awesome Cyber Monday deals up for grabs so be sure to make use of this opportunity to seize them. Step 1: Visit the ShopBack website and click on the Booking.com store at the bottom of the homepage. You can also use the search box to find the link to the link to the store. Step 3: If you are interested in finding attractive coupons, promo codes and deals check out the Booking.com promo code, coupon and voucher section. Step 4: You will be redirected to the Booking.com website to browse and book your travel. Step 5: When you confirm your booking, you will be eligible to earn cashback from ShopBack. In case you have a free cancellation booking due to a Booking.com coupon or promotion, you won't pay a cancellation fee. If your booking isn't free to cancel anymore or is non-refundable, you may incur a cancellation fee. Any cancellation fees are determined by the property, and you'll pay any additional costs to the property. Booking Assistant is a 24/7 virtual assistant that lets you send and receive messages from Booking.com. You can ask the Booking Assistant to request parking spaces, an extra bed, a different bed, alternative check-in or check-out times and more. The Booking Assistant can help answer any other questions you might have about your stay. You can find the Booking Assistant on your mobile phone, through the Booking.com app, on Booking.com’s website or mobile website, or using Facebook Messenger when you agree to receive your confirmation there. Keep in mind, the Booking Assistant isn't currently available for the tablet mobile website and apps. Further, the Booking Assistant is completely free to use, but it does require an internet connection. For other queries, customers can also contact them via e-mail by clicking on the ‘Customer Service’ link at the bottom of the main page to access the form. Callers can request for assistance on the Malaysian helpline numbers as given below. You can also follow them on social media to stay updated about latest deals and vacation packages.